Since it began in England in 1863, millions of people around the world enjoy playing soccer every year. But what’s even more rewarding than joining a soccer program as a player is deciding to coach soccer. Soccer coaching gives adults a chance to truly make a difference in young athletes lives and be seen as a strong role model. But unfortunately, there are some common misconceptions about coaching that often prevent people from signing up. So let’s take a look at a few misconceptions about the truth behind them. It’s all about winning. Perhaps the biggest misconception about coaching is that if your team doesn’t win, you failed at your job as a coach. But it’s important to remember that while winning is always great, it’s not the only thing that matters. When kids join a soccer program, they should understand that what really matters is that they try their best and have fun. And certified soccer coaches need to do their best to ensure their team understands this. Coaches should always encourage their players to do their best and support them no matter if they win or lose. Teaching skills is more important than coaching methodology. Another common misconception is that what you’re coaching is more important than how you coach. While it’s obviously important that players learn soccer skills, that’s not all that matters. Once players know the basics, it’s up to the coaches to decide on their methodology. 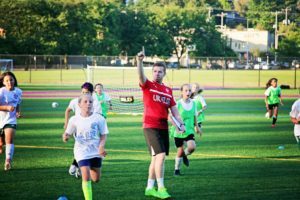 Having a strong coaching methodology that focuses on encouraging players to do their best, develop new skills, and work on what needs improvement is the best thing coaches can do for their team. Coaching isn’t fun. And lastly, many people assume coaching isn’t fun. They think it’s simply running their players through drills and yelling when players mess up. But that isn’t the case at all. While coaches do need to push their players to do their best, they can have fun while they do it. Creating fun warm-up drills, having team bonding parties, and celebrating after a good game are all fun aspects of coaching. Soccer coaches get to become someone their players look up to, and what’s more fun than that? So if you’ve been holding back from coaching because of these misconceptions, don’t let them stop you any longer. Coaching is a great way to give back to youth in the community and have fun while you’re doing it. 90,000 passionate fans, at least 18 of them from USA!